We will come to your house and get up on the roof to assess if any damage has occurred. We will discuss with you what we have seen, what you would like, your choices in roofing, and give you an estimate. If your insurance will cover damages, we will help you with this process to make sure everything is completely covered. 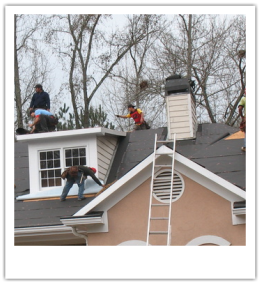 We will provide samples of different types and colors of shingles, pictures of roof replacements, and references of actual homes we have completed. We will order the materials that you have chosen, make sure they are delivered on time, and dropped where you have requested. An on-site manager will be there to make sure everything goes smoothly. We will then clean up any debris that is left.